Learning about the attributes of diamonds is important before making such an important purchase. The diamond is a complicated stone, and each aspect of it affects its overall beauty. This allows you to go beyond "The Four Cs" (Cut, Color, Clarity, and Carat Weight) and find out everything that gives a diamond both its beauty and its value. A diamond’s cut is not only about its shape, but how effectively the stone can return light back to the viewer’s eye. A well–cut diamond will appear very brilliant and fiery. Poorly cut stones can appear dark and lifeless, regardless of color or clarity. Clarity refers to the presence (or absence) of impurities, blemishes or other identifying characteristics within a diamond. Clarity characteristics are what make each diamond unique since there are no two diamonds that will have exactly the same inclusions in the same location(s). When shopping for a diamond, it is generally preferred to have the least amount of color possible. Diamond color is divided into five broad categories. Carat is a term that refers to the weight of a diamond. Before the twentieth century, diamonds were measured by using the carob seed that is small and uniform and served as a perfect counter weight to the diamond. It is those original carob seeds which are the origin of the word carat we use today. A certificate is a blue print of a loose diamond. Wholesalers, retailers, and consumers know a certificate as either a diamond grading report or diamond dossier. 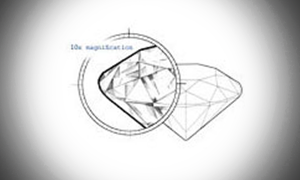 A certificate will tell a diamond’s exact measurements, weight, cut and overall quality. A diamond’s cost depends upon an objective characteristics knows simply as the 4C’s: Color, Clarity, Cut and Carat. 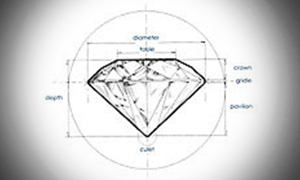 The relationship between these 4 characteristics determines the value of a diamond. 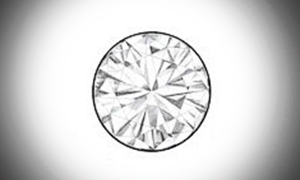 Our diamond grading charts will help you visualize the realtionship between rarity and cost. Although it is commonly assumed that Clarity is the most important member of the 4C’s, color, cut and clarity have a much greater impact on the appearance of a diamond. Diamonds come in many different shapes, and Lincroft Village Jewelers offers the highest quality certified diamonds to satisfy all tastes. Each diamond shape possesses its own unique quality, so exploring and learning about the various shapes is worth your while. This is the overall condition of the surfaces of a finished diamond. There are ratings of Good (GD), Very Good (VG), Excellent (EX), and Ideal (ID). Some quality diamonds display a visible light when they are exposed to ultraviolet light. This light is known as fluorescence. Under most lighting conditions, a diamond’s fluorescence is not visible to the naked eye. Depending on the setting, you can soak your diamond engagement and wedding rings for up to 30 minutes in a solution of dishwashing liquid and water. Prong or cathedral settings are the best for this. Pave and basket settings are more likely to allow your precious gems to come loose, and soaking can speed this process along. The happiest occasions of our lives are often those which are capped by the giving of something precious; whether a diploma for the excited grad, or a certificate of thanks for a job well done, or some other item of value. When it comes to events of a highly personal nature, jewelry is the right gift especially in the form of a diamond ring suitable to mark an engagement, wedding, or an anniversary. When you begin to create the engagement ring of her dreams, there is a lot to consider. Presented with almost limitless combinations of settings and diamonds, it is easy to get flustered. By going step–by–step and making sure that all of your questions are answered, you can easily find yourself designing the perfect diamond engagement ring. Set yourself a budget before you start the process. Know that an engagement ring setting with diamond side stones will take up more of your budget than a simple band for a solitaire ring. Decide how intricate you want the setting to be before you put most of your money into the center stone. Choosing the right metal for an engagement ring is crucial, yet simple. When presented with the choices of white gold, yellow gold, or platinum, you need only pay attention for a few days. Primarily known for its simplicity and durability. This setting style encases the surrounding outer edge of the diamond in a fine frame of metal (Gold or platinum). When using white gold or platinum it can often give the diamond a larger appearance. Most people know their ring sizes. If the engagement ring is not a surprise, then ask. If it is a surprise, measure one of her rings and then compare it to a ring sizer, or ask a close friend or relative. Remember that you can have a ring resized once at no extra charge within 60 days of purchase. The style of an engagement ring setting should match the personality of the person who will be wearing it. A classic woman with simpler, more streamlined taste will probably prefer a beautifully–made solitaire setting with one fantastic diamond. For women who like a lot of sparkle, an intricate pave setting with rows of diamonds might be preferable. It is much easier to purchase a wedding set, which includes both the engagement ring and the wedding band. The downside, however, is that you have fewer choices. Finding the perfect engagement ring can be challenging for couples who plan to marry. In day’s past, the young man would choose a ring and present it to his intended, but today it is increasingly common for the future bride and groom to shop together to select the ring. No matter how you go about choosing a ring, we’re offering to you a brief lesson in diamond education to help you find that perfect engagement ring. These symbols of lifelong commitment not only reflect the two of you as a couple, but each of you individually as well. While a wedding ring should, in some way, be similar to the engagement ring it sits next to, it need not also be similar to the man's wedding band. Once you have chosen an engagement ring, finding the right wedding ring is easy. There are more choices for men’s wedding rings wedding rings than ever before. Many men choose a simple gold band because they are not aware of the options that are available to them now. Choosing the right style is as important as it is for a women’s wedding ring. A woman’s wedding band should roughly reflect the style of her engagement ring, but it doesn’t need to be an exact match. A simple, classic band will go with any style, while a carved ring will be best suited to sit next to a more basic engagement ring. It is much easier to purchase a wedding set, which includes both the engagement ring and the wedding band. The downside, however, is that you have fewer choices. Wedding sets are designed so the diamond engagement ring and wedding band are the same style and sit flush with one another on a woman’s finger. 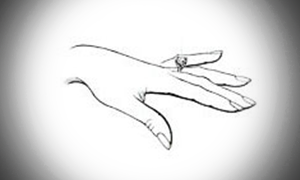 The width of a woman’s wedding ring depends entirely on the width of the band on her engagement ring. If a woman with small hands already has a large, wide engagement ring, choosing a narrower band for her wedding ring is a better choice for her comfort. It has only been within the last two generations that most grooms have been exchanging wedding bands with their brides. Called “double ring ceremonies” this phenomenon slowly caught on after the Second World War and has been growing ever since. Fine Jewelry is a welcome addition to any woman's collection. Pearls, gemstones, diamond studs and pendants compliment any occasion and add a touch of class. Although personal taste and style dictates what type of fine jewelry fits what type of situation, there are certain things you should consider. A pearl is a valued gemstone that is naturally created by a marine-based organism called a mollusk (otherwise known as an oyster). Gemstones, like diamonds, have different grades of quality, and it is important to educate yourself about the qualities that are assessed to determine the overall value of your chosen stone. A pendant (from Old French) is a hanging object, generally attached to a necklace or an earring. In modern French this is the gerund form of “hanging” (also meaning “during”). How to choose the Perfect Diamond Studs? If you are looking for the perfect diamond studs to give to that special someone on your list for this new year, consider a fabulous pair of diamond stud earrings. Fine diamond jewelry has long been considered one of the most perfect gifts, and stud earrings are the classic fine jewelry gift; in fact diamond studs have become a great gift for both men and women. When it comes to diamond stud earrings, there are many great choices. You can find earrings to suit every taste and style. Platinum is one of the rarest metals and so it is extremely valuable. The annual worldwide production of platinum is only around 160 tons. Compare that to the approximate 1,500 tons of gold being produced worldwide per year and you can understand platinum’s huge appeal. Yellow gold is the most common form of gold found in jewelry and is usually mixed with copper and silver. Its color depends upon the amount of pure gold in the alloy. White gold is quickly becoming the most popular style of gold. Often, white gold is purchased in 14 carat jewelry because it looks more similar to platinum. Rose gold is a copper and copper mixture that often appears in custom jewelry due to its distinctive reddish color. Sometimes it is also referred to as Russian gold, because it was popular in the early 19th century.